For the album by Trash Boat, see Trash Boat. Crown shyness (also canopy disengagement, canopy shyness, or intercrown spacing) is a phenomenon observed in some tree species, in which the crowns of fully stocked trees do not touch each other, forming a canopy with channel-like gaps. The phenomenon is most prevalent among trees of the same species, but also occurs between trees of different species. 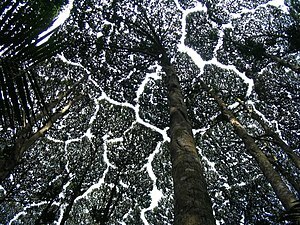 There exist many hypotheses as to why crown shyness is an adaptive behavior, and research suggests that it might inhibit spread of leaf-eating insect larvae. 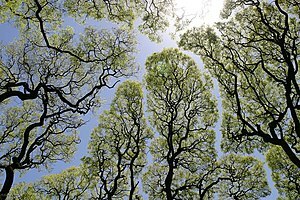 The exact physiological basis of crown shyness is not certain. The phenomenon has been discussed in scientific literature since the 1920s. The variety of hypotheses and experimental results might suggest that there are multiple mechanisms across different species, an example of convergent evolution. Some hypotheses contend that the interdigitation of canopy branches leads to “reciprocal pruning” of adjacent trees. Trees in windy areas suffer physical damage as they collide with each other during winds. As the result of abrasions and collisions, there is an induced crown shyness response. Studies suggest that lateral branch growth is largely uninfluenced by neighbors until disturbed by mechanical abrasion. If the crowns are artificially prevented from colliding in the winds, they gradually fill the canopy gaps. This explains instances of crown shyness between branches of the same organism. Proponents of this idea cite that shyness is particularly seen in conditions conducive to this pruning, including windy forests, stands of flexible trees, and early succession forests where branches are flexible and limited in lateral movement. By this explanation, variable flexibility in lateral branches has a large bearing on degree of crown shyness. Similarly, some research suggests that constant abrasion at growth nodules disrupts bud tissue such that it is unable to continue with lateral growth. Australian forester M.R. Jacobs, who studied the crown shyness patterns in eucalyptus in 1955, believed that the trees' growing tips were sensitive to abrasion, resulting in canopy gaps. Miguel Franco (1986) observed that the branches of Picea sitchensis (Sitka spruce) and Larix kaempferi (Japanese larch) suffered physical damage due to abrasion, which killed the leading shoots. A prominent hypothesis is that canopy shyness has to do with mutual light sensing by adjacent plants. The photoreceptor-mediated shade avoidance response is a well-documented behavior in a variety of plant species. Neighbor detection is thought to be a function of several unique photoreceptors. Plants are able to sense the proximity of neighbors by sensing backscattered far-red (FR) light, a task largely thought to be accomplished by the activity of the phytochrome photoreceptors. Many species of plant respond to an increase in FR light (and, by extension, encroaching neighbors) by directing growth away from the FR stimulus and by increasing the rate of elongation. Similarly, blue (B) light is used by plants to induce the shade-avoidance response, likely playing a role in the recognition of neighboring plants, though this modality was just beginning to be characterized as of 1998[update]. The characterization of these behaviors might suggest that crown shyness is simply the result of mutual shading based on well-understood shade avoidance responses. Malaysian scholar Francis S.P. Ng, who studied Dryobalanops aromatica in 1977 suggested that the growing tips were sensitive to light levels and stopped growing when nearing the adjacent foliage due to the induced shade. A 2015 study has suggested that Arabidopsis shows different leaf placement strategies when grown amongst kin and unrelated conspecifics, shading dissimilar neighbors and avoiding kin. This response was shown to be contingent on the proper functioning of multiple photosensory modalities. A 1998 study proposed similar systems of photoreceptor-mediated inhibition of growth as explanations of crown shyness, though a causal link between photoreceptors and crown asymmetry had yet to be experimentally proven. This might explain instances of intercrown spacing that are only exhibited between conspecifics. ^ Peter Thomas; John Packham (26 July 2007). Ecology of Woodlands and Forests: Description, Dynamics and Diversity. Cambridge University Press. p. 12. ISBN 978-0-521-83452-0. ^ Norsiha A. and Shamsudin (2015-04-25). "Shorea resinosa : Another jigsaw puzzle in the sky". Forest Research Institute Malaysia. ^ a b c K. Paijmans (1973). "Plant Succession on Pago and Witori Volcanoes, New Britain" (PDF). Pacific Science. University of Hawaii Press. 27 (3): 60–268. ISSN 0030-8870. ^ "Tropical Rain Forest". Woodland Park Zoo. p. 37. ^ Franco, M (14 August 1986). ". The influences of neighbours on the growth of modular organisms with an example from trees". Biol. Sci. 313 (1159): 313, 209–225. doi:10.1098/rstb.1986.0034. Retrieved 10 June 2016. ^ Victor Lieffers. "Crown shyness in maturing boreal forest stands". SFM Network Research Note Series. 36. ISSN 1715-0981. ^ Maxwell Ralph Jacobs (1955). Growth Habits of the Eucalypts. Forestry and Timber Bureau. ^ M. Franco (14 August 1986). "The Influences of Neighbours on the Growth of Modular Organisms with an Example from Trees". Philosophical Transactions of the Royal Society B. 313 (1159): 209–225. doi:10.1098/rstb.1986.0034. ^ Ballaré, CL; Scopel, AL; Sánchez, RA (19 January 1990). "Far-red radiation reflected from adjacent leaves: an early signal of competition in plant canopies". Science. 247 (4940): 329–32. doi:10.1126/science.247.4940.329. PMID 17735851. ^ Ballare, C. L.; Sanchez, R. A.; Scopel, Ana L.; Casal, J. J.; Ghersa, C. M. (September 1987). "Early detection of neighbour plants by phytochrome perception of spectral changes in reflected sunlight". Plant, Cell and Environment. 10 (7): 551–557. doi:10.1111/1365-3040.ep11604091. ^ Ballaré, CL; Scopel, AL; Sánchez, RA (June 1997). "Foraging for light: photosensory ecology and agricultural implications". Plant, Cell and Environment. 20 (6): 820–825. doi:10.1046/j.1365-3040.1997.d01-112.x. ^ Jansen, Marcel A.K; Gaba, Victor; Greenberg, Bruce M (April 1998). "Higher plants and UV-B radiation: balancing damage, repair and acclimation". Trends in Plant Science. 3 (4): 131–135. doi:10.1016/S1360-1385(98)01215-1. ^ Christie, JM; Reymond, P; Powell, GK; Bernasconi, P; Raibekas, AA; Liscum, E; Briggs, WR (27 November 1998). "Arabidopsis NPH1: a flavoprotein with the properties of a photoreceptor for phototropism". Science. 282 (5394): 1698–701. doi:10.1126/science.282.5394.1698. PMID 9831559. ^ a b c F.S.P. Ng (1997). "Shyness in trees". Nature Malaysiana. 2: 34–37. ^ Crepy, María A.; Casal, Jorge J. (January 2015). "Photoreceptor-mediated kin recognition in plants". New Phytologist. 205 (1): 329–338. doi:10.1111/nph.13040. PMID 25264216. ^ Margaret Lowman; Soubadra Devy; T. Ganesh (22 June 2013). Treetops at Risk: Challenges of Global Canopy Ecology and Conservation. Springer Science & Business Media. p. 34. ISBN 978-1-4614-7161-5. ^ R. G. Florence (January 2004). Ecology and Silviculture of Eucalypt Forests. Csiro Publishing. pp. 182–. ISBN 978-0-643-09064-4. This page was last edited on 17 April 2019, at 13:27 (UTC).